The wind started up this morning and is blowing steady now with huge gusts. The air is filled with dust and you can see clouds of it in the distance. I was walking back from the visitor center today and thought I heard a faint mechanical sound. I kept hearing it as I walked closer to the apartments and realized it was the wind blowing through and off the high cliffs that are close to us on the north side. A different sound than the wind going through the ponderosa pines at the Grand Canyon or at Rocky Mountain and an interesting experience. Monday evening it looked like there would be a good sunset so I walked out in front of our duplex. As they say, sometimes the best picture is behind you and behind me the nearly full moon was rising over a cliff near our duplex right as the sun was setting. A while later the sky was a deep blue in the east and some detail on the rocks was still visible. I shot various compositions and then saw a bird flying through the frame. What luck, I thought, maybe I’ll get one shot of the bird. 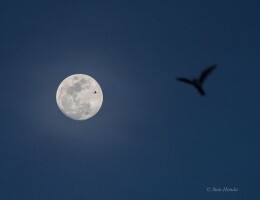 As I was editing the pictures I saw what I thought was a dust speck on the moon- ugh. I enlarged it and saw it was an airplane, in the same frame as a nicely positioned bird. Complete luck! Nothing to do with skill! 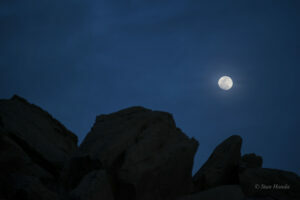 Continuing with the moon theme, I include a shot of the moon setting behind Pueblo Bonito. Click on the picture to see it bigger and you see all the stars visible even with a crescent moon on the horizon. The Milky Way is on the right and about in the middle is the Andromeda Galaxy (fuzzy thing just above the great house). 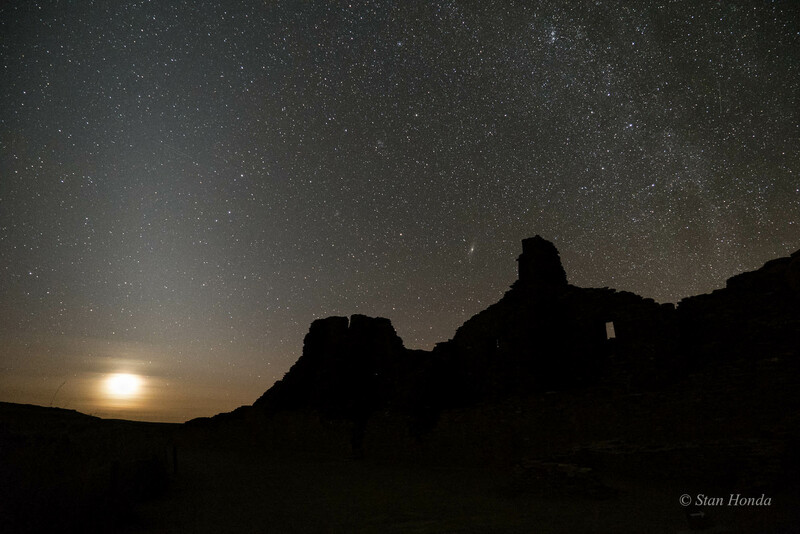 Moon set behind Pueblo Bonito.